Granada, 니카라구아의 호스탈 아술 | 호스텔월드에서 예약하세요. Spacious, comfy common areas allow people to relax or mingle and hangout with new friends. We are at an excellent spot in the very heart of Granada, conveniently located one block away from the Cathedral, central park and Calzada(Main street). Half a block away from the express bus station to Managua, and one block away from the market. 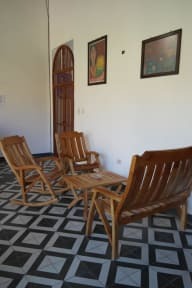 We have a privileged location, at the historical center of Granada, 30 minutes to Volcan Masaya and 15 minutes to Laguna de Apoyo (We offer transportation and tours to these and other locations). 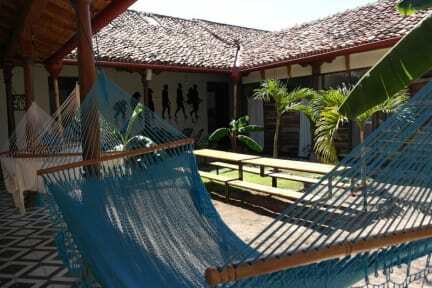 Beautiful rooms, very spacious and clean, we provide fresh and clean sheets on arrival. Our utilities include a clean kitchen and fridge you can use when needed. Free coffee, Wi-Fi, Netflix and free calls to U.S. and Canada. Laundry service and transportation to and from the airport and main tourist spots. We organize a weekly free pool day (and other activities every day). We have a book exchange, board games, a guitar and free gym access for 5 days.